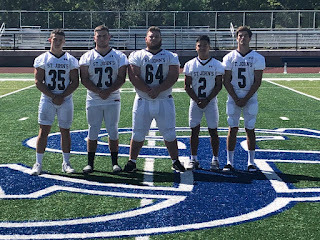 St. John's Prep captains Cole Tangney, Kevin Dewing, James Taylor, Aise Pream, and Wes Rockett (Left to Right) Hope to Hold Off a Dangerous CM Team. This morning, we unveiled our Division 3 Super Bowl preview that features Tewksbury and Springfield Central and now we are set to release our Division 1 preview that is matchup between Catholic Conference rivals in St. John's Prep and Catholic Memorial. Preview: There is no lack of familiarity between these two Division 1 Super Bowl participants. Catholic Conference rivals St. John's Prep and Catholic Memorial played back in week five, with the Eagles pulling out a 27-20 road victory. Since that point, the Knights young talent has only improved helping them become one of the most dangerous teams in Massachusetts. Leading that young core is junior quarterback Barrett Pratt, sophomore running back Darius Leclair, and superstar-in-waiting sophomore Owen McGowan. Pratt has only progressed as the year has gone on, including most recently throwing for three touchdowns in a Thanksgiving Day win over BC High. McGowan, meanwhile, is disruptive in all three phases of the game. Surrounding the young pieces on CM is a plethora of veteran stars. 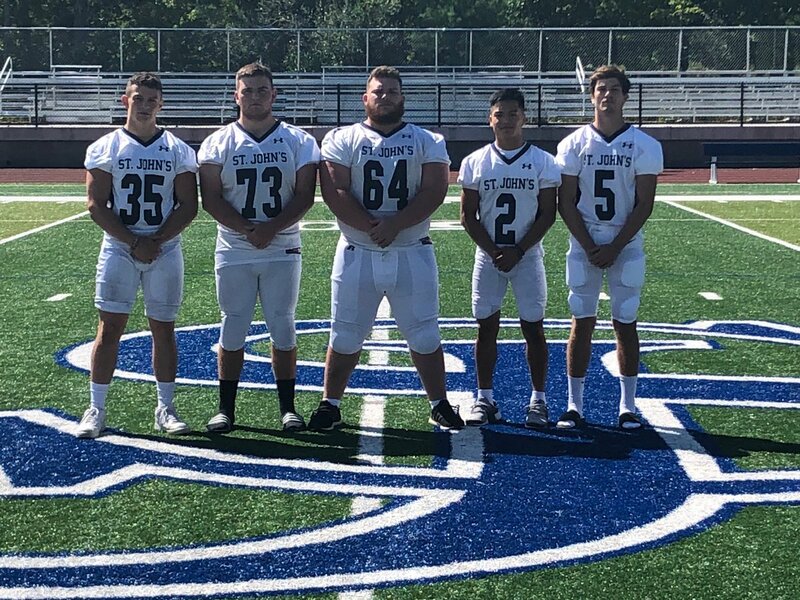 Two-time Catholic Conference Defensive Player of the Year Lucas Folan leads a stout defensive line, while seniors Khari Johnson and Hunter Tully are big keys on both sides of the ball. The Knights line highlighted by Hunter Salmon, Rory Conneely, and Quincy Plumer sets the stage for their running game. Jamall Griffin, Zach Mitchel, and Leclair are the primarily ball handlers as CM has put up over 32 points on average. St. John's Prep was on a dominant run before falling on Thanksgiving Day to Xaverian. The Eagles are buoyed by a ferocious defensive line led by senior tackles James Taylor and Kevin Dewing. Charlie Giunta has been a thorn in quarterback's sides at defensive end. Matt Duchemin and Wes Rockett are valuable members of the secondary. Overall, the Eagles defense has allowed just 12.7 points per game, and over 20 points just twice. Matt Crowley got valuable experience as a sophomore and has used it to have a monster junior season. Crowley set the all-time single season record for passing yards in program history with Rockett and Max Freedman as the primary targets. Aise Pream is a premiere running back, but has been hampered by a leg injury. When Pream has not been able to go, senior Trent Tully has filled in admirably. While both sides have plenty of speed and skill, its likely this game will be won in the trenches. Catholic Memorial's offensive line has played well all season long, but it will have its hands full against what is arguably the top defensive front in the state. When given time to throw, Barrett Pratt has been efficient this season for the Knights especially over the last month while Jamall Griffin and Darius Leclair have been a consistent presence on the ground. More importantly, however, the Knights offense depends on getting into an um-tempo, fast paced rhythm. If the likes of James Taylor, Charlie Giunta, and Kevin Dewing are able to consistently win the battle up front, and generate pressure on the Knights in the backfield, it will be difficult for CM to develop the offense needed to knock off the Prep. Conversely, the CM front, highlighted by Lucas Folan and Owen McGowan, will have to keep Crowley uncomfortable before he can develop a rapport with his receivers. In the first game between these two sides, St. John's Prep quarterback Matt Crowley was able to take advantage of mismatches in coverages while also consistently completing short throws to extend Eagle drives. Crowley was so patient and methodical on one drive that the Eagles held the ball for 22 plays and over 10 minutes. Wes Rockett and Max Freedman have been two of the top receivers in Division 1, while Anthony Fagan is dangerous at tight end. With Aise Pream largely diminished due to injury, the Eagles will likely rely heavily on moving the ball through the air. It is up to the Knights secondary to limit the big play and get their defense off the field.